Also known as "Dîner intime"
"When it comes to conflict, even chameleons won't change! Peace in the rain forest is disrupted when two chameleons literally get stuck in a conflict, with catastrophic results. Relationships are severed, opportunities are lost, innocent bystanders are harmed and violence seems imminent. 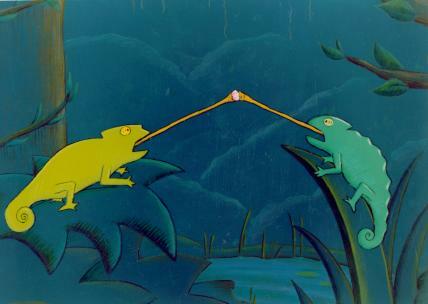 Luckily for the lizards, a frog observing the fracas turns into exactly what they need -- no, not a prince -- a mediator. Dinner for Two tackles conflict in a lively, humorous and provocative way. It shows that amidst the chaos that differences create, there are still paths to reconciliation. This film is part of the ShowPeace series of lively animated films about conflict resolution. This series has received support from UNICEF and Justice Canada." National Film Board of Canada. "NFB -- Dinner for Two." National Film Board of Canada. http://onf-nfb.gc.ca/en/our-collection/?idfilm=33131.